Congress is debating how to keep low interest rates for college loans available – but why are all those loans necessary in the first place? Not so long ago, higher education wasn’t just a way to train future scientists, entrepreneurs, and leaders – it was a path to equal opportunity, something good for our economy and democracy. Tuition levels reflected that understanding: in 1990, University of Washington tuition was just $3,434 (in 2012 dollars). The cost of educating a student at the University of Washington is about $400 less today, in inflation adjusted dollars, than it was 20 years ago. As executives and directors of large business and philanthropic organizations in Washington state, our board members can attest that this could not have happened without a strong commitment to efficiency and cost control. 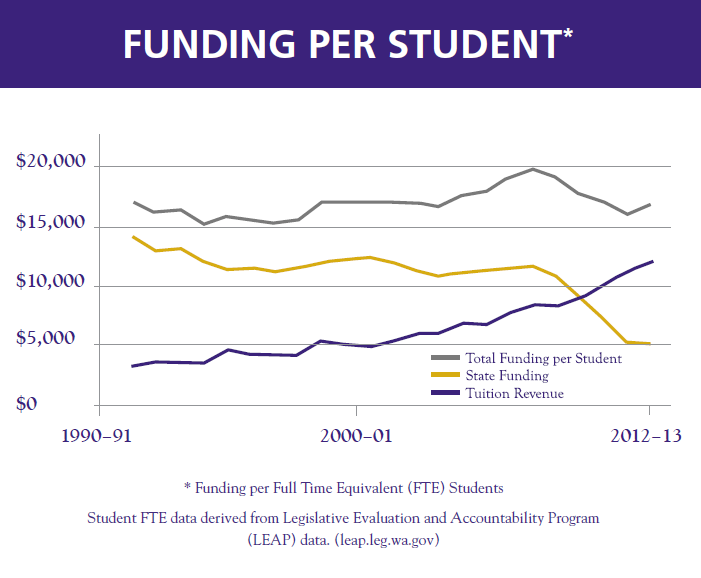 The total cost per student a the University of Washington is slightly lower than 20 years ago – but state funding has dropped significantly, so tuition hikes have made up the difference. The next time anyone questions why public university tuition is rising faster than inflation, remember this: Twenty years ago, the state government paid 80 percent of the cost of a student’s education and a student paid 20 percent. Today, the state pays 30 percent of the cost, and the student pays 70 percent. The state has systematically disinvested in our children’s future, and we view this trend with disappointment and alarm. In 1990, higher education comprised nearly 14% of Washington’s general fund spending, or about $1.6 billion in 2011 dollars. Last year, just 9.1% of the general fund ($1.35 billion) supported higher education. In the past 4 years alone, the University of Washington and Western Washington University have each lost more than half of their state funding. Multiple years of double-digit tuition increases are filling the gap in state funding, forcing hardworking students to go ever-deeper into debt to get a shot at the American dream. Today, 60% of college graduates in Washington are saddled with an average of $22,000+ dollars in student debt. Equal opportunity means making sure a college degree is available to every student willing to apply themselves and work for it – not just those able to afford the price of admission. We once built the foundations for a strong economy and secured our children’s educational future by honoring a shared commitment to keeping college affordable with our tax dollars. We can do the same today.